Rewind back to Issue #102 of Singletrack Magazine, for Chipps’ review of the Shimano Deore XT M8000 Drivetrain. Shimano’s second-from-top mountain bike groupset is, for many, THE Shimano groupset. While XTR (‘XT Race’, didn’tcha know) is the flagship, top-end, all the gadgets, James Bond groupset, XT is the racer’s tool and the adventurer’s companion. XTR is developed in Shimano’s very secret labs with a no-limits mindset that puts the weight of the group above all and uses any means necessary to achieve that, while still offering great performance. Deore XT is the workhorse of the Shimano mountain bike groupset bunch. XT then gets to benefit from all of the R&D put into XTR and uses many of the innovative ideas, with slightly less expensive materials. This nearly always results in products that are just as good, sometimes more durable and only a tiny bit heavier. Much is made of XTR’s mirror polish finish and this labour-intensive process must add much to the group’s lofty price. XT tends to have a plainer, more workmanlike finish which ironically seems to wear and weather more flatteringly, like a good pair of denim jeans. Shimano’s Deore XT hollow cranks have long been known for their lightweight, stiffness, and durability. Let’s start at the cranks, the heart of the group. 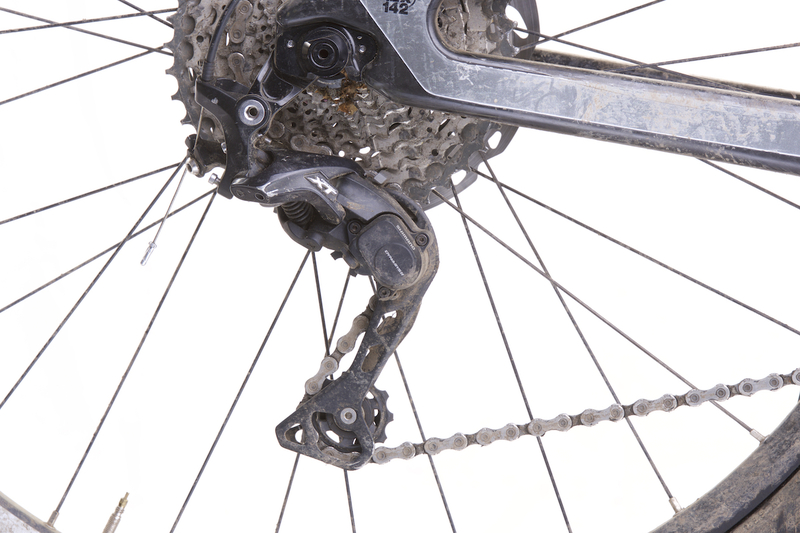 The chainset features an offset four arm spider on a forged crank. This mirrors what’s been done on the road and gives the most support to the chainring at the power stroke. Talking of chainrings, the cranks are available without a ring if you want to fit your own aftermarket ring. The tall-toothed steel Shimano single rings are £50-£60 and come in 30T up to 34T. 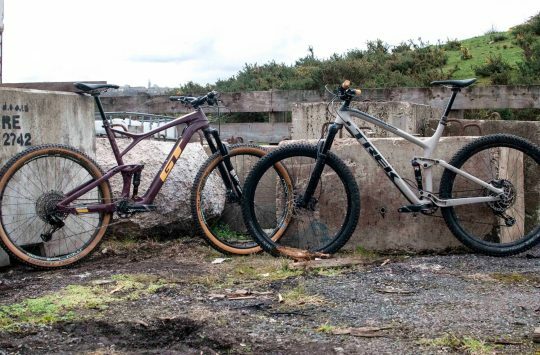 29er riders may miss having a 28T and racers too may lament the omission of a 36T. The Shimano bottom bracket has been the usual fit and forget job, especially in our threaded BB shell Saracen test frame. 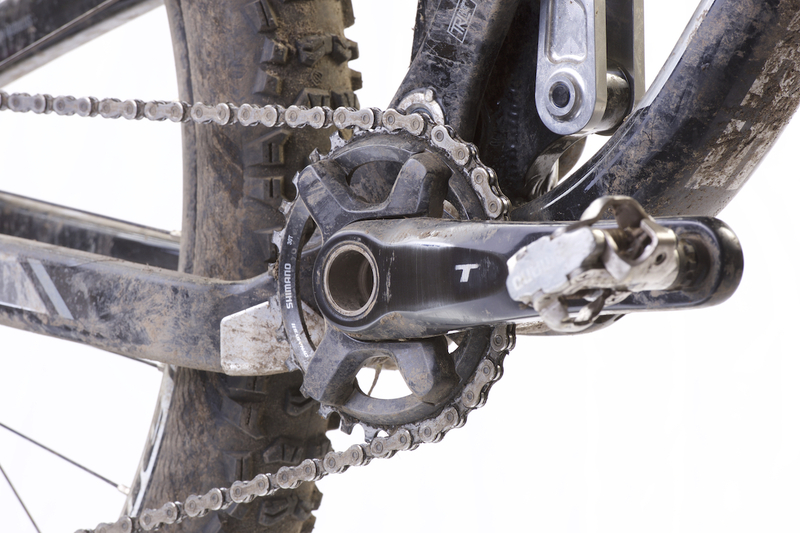 Despite the lack of thick-thin profile to the single ring, the chain has stayed on under all normal trail riding conditions, even without a chain guide. For racing, you might want to add another few grams of peace of mind, but I’ve found it stayed on fine – unless I was backpedalling over rocks having ghost-shifted a few times. 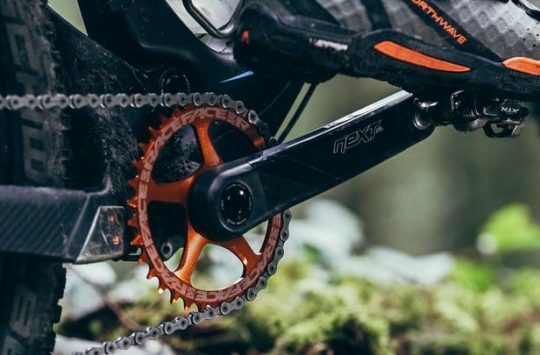 And after six months of use, the cranks are showing a bit of wear to the anodising and the logo, but it looks like well-earned ‘denim’ wear to be proud of, whereas our XTR cranks suffered ‘Oh no!’ cosmetic wear after just one ride. 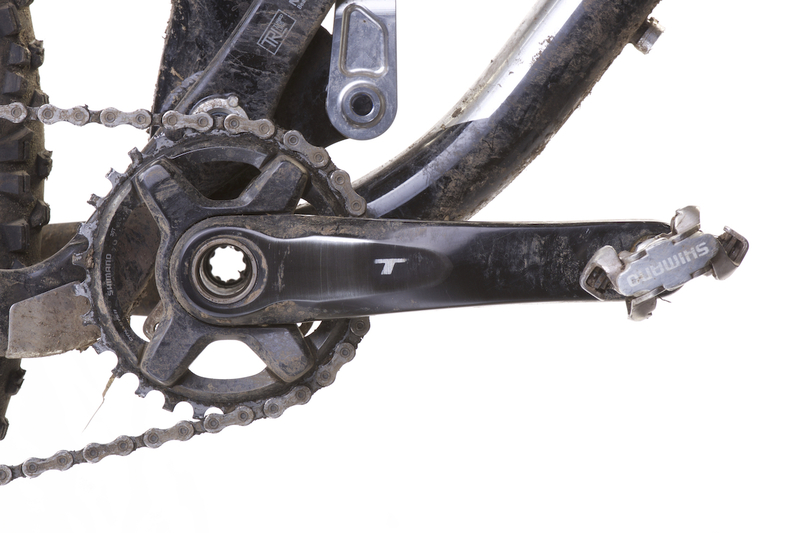 The XT 11-speed cassette is available in 11-40t, 11-42t and 11-46t ratios. Moving to the rear mech and the cassette, Shimano deserves a round of applause for working out how to fit 11 sprockets on to a normal 10 speed cassette body. 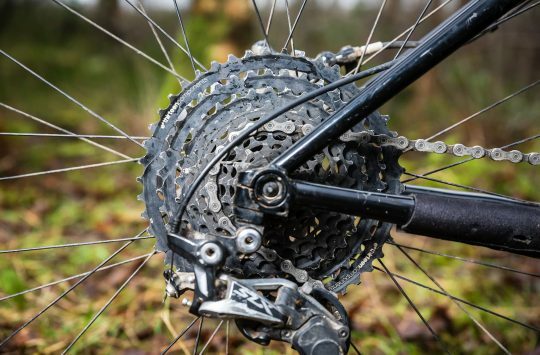 In a world where everything seems to be changing too quickly, it’s great to see Shimano keeping to a standard that means riders won’t have to swap their wheels out just to gain a sprocket. The 11-42 cassette is a thing of beauty too, with the larger sprockets (supported on alloy carriers rather than XTR’s carbon ones) arching gracefully backwards over the spokes to make room for that all-important sprocket. And it is important. The difference between the 40T of the XTR cassette and the 42T of the XT might just be the difference between a ride and a push on a big Lakeland or Alpine mountainside. With its slim profile, the Shadow Plus Deore XT derailleur tucks in neatly underneath the cassette. 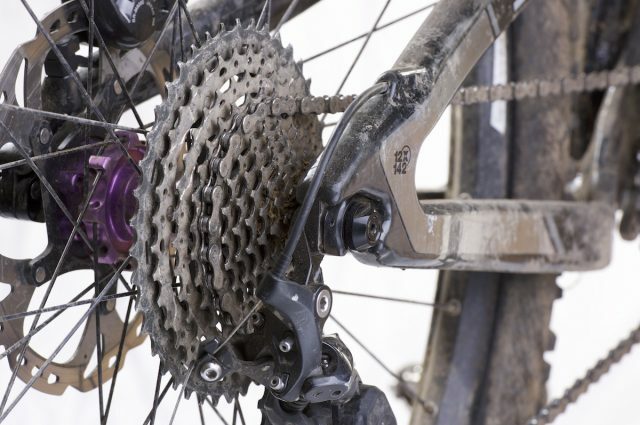 Shifting over the 11 sprockets is the new XT rear derailleur. Unlike SRAM 11-speed derailleurs that changed dramatically in look as they went ‘up to eleven’, this looks like a common or garden rear mech. The clutch lever has a long throw, like that on the XTR, though the XT one is plastic rather than alloy. It’s actually far easier to operate, though, so another mark for XT. The shifting on the new XT levers is more positive than shifters of old. The single shifter has many of the design cues from XTR, with a slim and dot-textured thumb lever and a ribbed trigger lever. Thumb effort when shifting up the block has been deliberately evened out, so that the effort from 10th to 11th gear is the same as at the low end of the block. 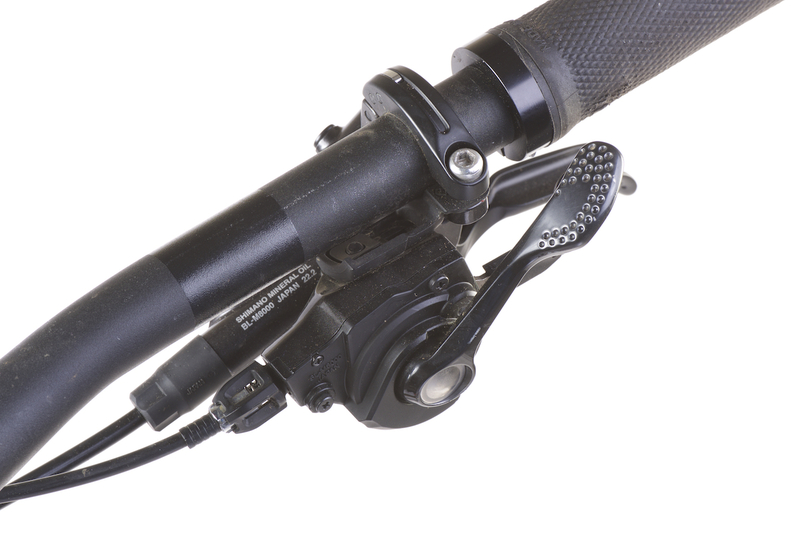 With this new Multi-Release shifting system, though, Shimano has retained the double-shift on a thumb-press forward of the trigger shifter, but reduced shifting to a single gear at a time when pulling on the finger trigger. This particularly annoys me. And Barney. It might annoy you too. There’s plenty of adjustment in the shifter’s position, even in its I-spec mode and attached to the minimalist brake lever clamp. The action of the lever is lighter than before and adds to a feeling of quality, though perhaps diminishes a feeling of security, regardless of the reality. There’s a neat ‘snick’ to the action, rather than a more positive click. This aids quick shifting and certainly helps in your sneaky attacks from the back of the pack. 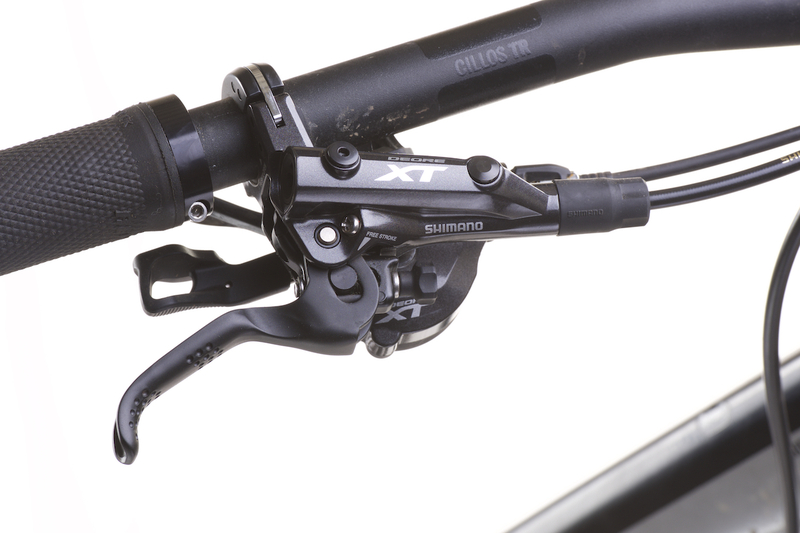 With a simple bleed procedure and the tools free adjuster, the XT brake levers are easy to live with. Moving on to the brakes, they share the same ‘pared down to the minimum’ look of the XTR brakes. With our (admittedly early production) XTR trail (and race) brakes, we’ve had odd, variable lever positions on factory-bled brakes which seemed nothing to do with head buildup. One minute the lever was full, the next it was halfway to the bars. 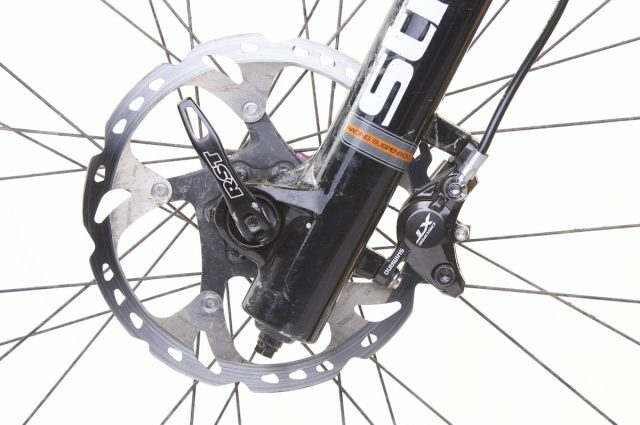 With these XT brakes, though, we’ve had none of that, which is reassuring. Some riders don’t like the snappy feel of Shimano’s Servo Wave levers (where the brake pads are initially accelerated towards the rim before the lever ratio changes to a shorter throw and higher power), but I like it. It keeps the pads away from the rotor as much as possible in muddy conditions, but you can still get hard braking if you grab a handful. The stock finned pads have lasted well, but like many economy-minded riders, I’m unlikely to replace them like for like when they’ve worn out. The 50° temperature hike at the rotor isn’t going to be noticeable on the short, cold, descents I tend to ride 98% of the time. If I were off to the Pyrenees for a week, then I would think about going back to the fancy pads though. At the other end, the Deore XT callipers deliver loads of power, but it’s the huge pad clearance on the rotors that we really appreciated. The wheels will get a separate review when we’ve had more time (we have, and you can read the review here) on them as they didn’t fit our test mule’s 20mm fork, and we’ve obviously not been able to report on the front mech performance yet. For the current 1×11 system, though, everyone has been very impressed so far. The price tag is so much lower than XTR, yet it retains (and in my opinion even improves upon) the performance of the gears and especially the brakes. Without the time consuming mirror polish to the components, XT is both cheaper and looks better as it wears. The 11-42T cassette that fits on a regular hub deserves accolades alone. As the winter months go by, I’ll be interested to see how the tall-toothed single ring wears, but for now, it’s been near-on faultless. Shimano’s M8000 XT groupset is great value for great performance. Simple as that.